To set the benchmark for audio visual solutions within the South African market, and to be recognised for products and services of the highest calibre. Remain focused on our customers’ needs and at all times offer consistent, professional advice, allowing customers to trust that we can meet and exceed their expectations. Add value to our customers, business partners and employees. 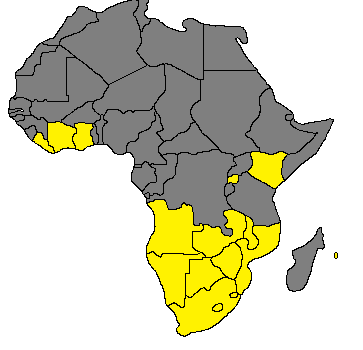 AVC has been implementing AV systems across the the African Continent for the past 15 years. We understand the unique travel and import/export requirements required for the different countries across the continent. We understand how to deploy technical personal effectively with the correct tools and knowledge to implement complex AV systems in in regions with scarce local resources and support. We employ highly skilled and experienced technical staff and some of our accreditation is listed below. 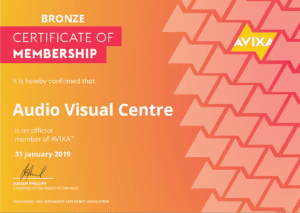 Audio Visual Centre is an InfoComm International® member. InfoComm International® is the trade association representing the professional audiovisual and information communications industries worldwide. 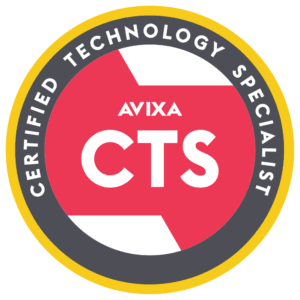 CVE Certification, Control 4 technical training, AMX boot camp, Polycom training. Crestron / Kramer training and SACIA GEN11 AV training. All our technicians undergo frequent in-house training and have many years of experience in an extensive range of product installation and programming.